What's at stake in the wetlands of Baca Park in Taos? 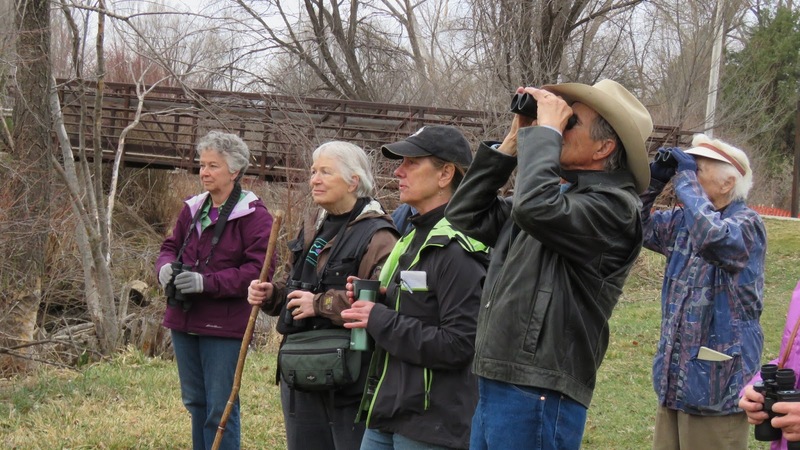 Seventeen birders, some from as far away as Los Alamos, gathered in Baca Park in Taos on Saturday morning, April 9, 2016. According to Meg Peterson, who writes a lively birding column for The Taos News, there is a lot at stake over the wetlands in and around Baca. The Rio Don Fernando meanders through the park. 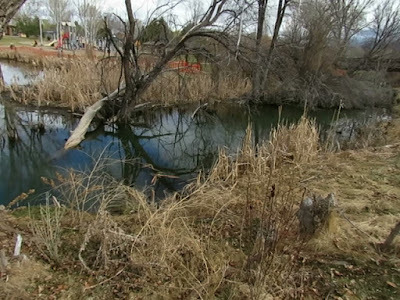 On the edge of the mown grass where children play on the swings, the beavers are hard at work to create dams that deepen the flow of the river. Though the water looks murky, the dams create great habitat for not only huge bullfrogs, but many aquatic nesting birds and migrating species. 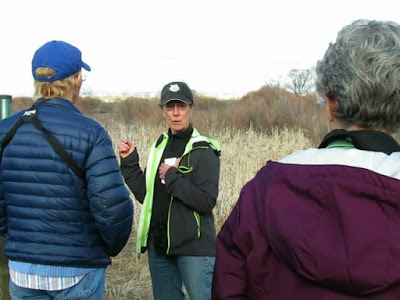 Peterson mentioned that on a previous visit someone heard the endangered Southwestern Willow Flycatcher. The park is surrounded by huge old cottonwood trees. One of the first things we noticed were a couple of Turkey Vultures hanging out in the trees, probably waiting for the thermals to rise. Later, when the sun came out four vultures soared in slow circles above us, then returned to the cottonwood tree to stretch and warm their wings in the morning sun like giant butterflies. Vultures warm their wings in the morning sun. The highlight of the morning was what Peterson called “the cacophonous Virginia Rails. 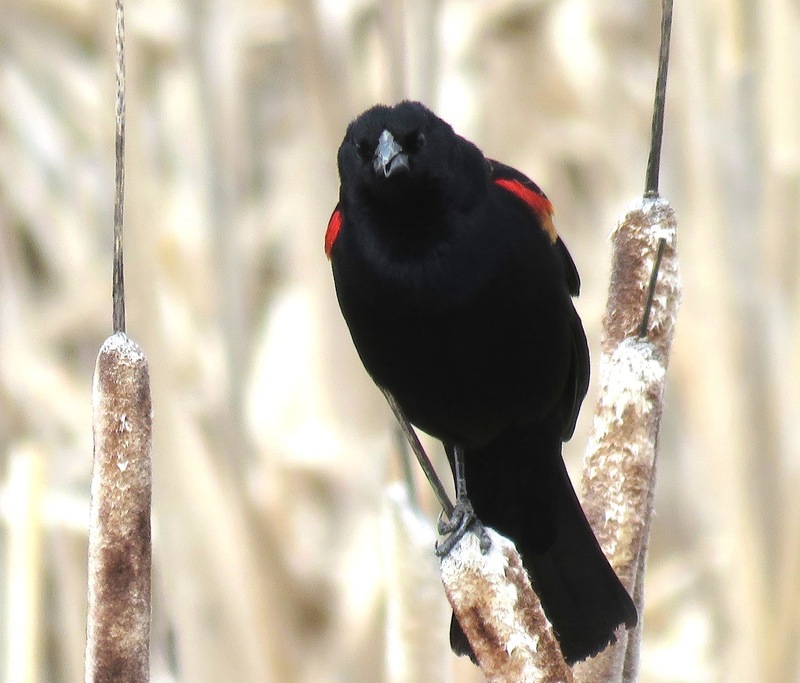 Though only a few of us actually saw them, their loud clacking in various parts of the cattail marsh declared their presence, perhaps two nesting pairs. We're looking forward to seeing those photos," she wrote in her newsletter. "Weren't they something!? Isabella reported hearing the rails from three distinct areas of the marsh." We followed a raised walkway into the marsh to a lookout point where we trained our binoculars on a blue-gray belted Kingfisher perched on branch, a pair of Yellow-rumped Warblers flitting through the trees, song sparrows, siskins, a darting flock of American Goldfinches, and Black-capped Chickadees. The air was sweet with the sound of warbling Red Winged Blackbirds and long-tailed blackbirds, and I finally got the shot I wanted of one of them, perched on top of a dried cattail, pumping out it's vibrant red wings with each trilling, seductive call. 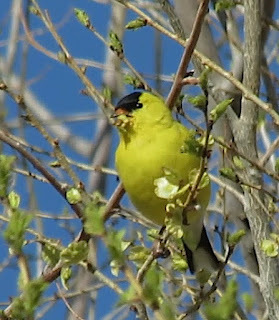 For a full list of sightings, posted on eBird see: http://ebird.org/ebird/view/checklist?subID=S28836876Oh. 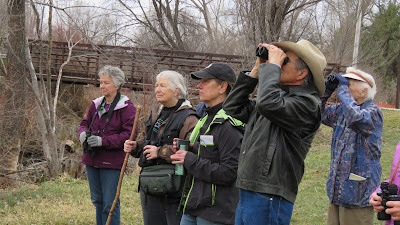 Peterson plans to post more info on possible bird walks on Migratory Bird Day, Saturday, May 14. Also, see Meg's blog at: www.megscherchpeterson.com.